Tickhill dropped out of the South Yorkshire League Championship promotion places following a crushing defeat at the hands of Treeton. The Doncaster club were asked to bat first and simply had no answer to Treeton veteran Steve Foster. He trapped four victims leg before wicket, had two others caught behind and bowled another to return excellent figures of 7-28 as Tickhill collapsed to 57 all out. Treeton achieved an eight wicket win in 12.3 overs to leapfrog Tickhill, who dropped to fourth, in the table. After successive losses Whitley Hall returned to winning ways and at the same time sent their opponents Wath to the bottom of the Championship by beating them by eight wickets at Moor Road. Whitley Hall, who top the table, elected to field first and after an inauspicious start Wath’s innings stood at 72-4. Wickets fell regularly after this and the innings crumbled to 94 all out. Tom Fletcher recorded 5-10 for Whitley. 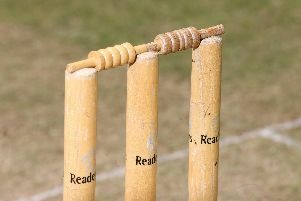 Whitley lost their first wicket before a run had been scored and experienced brief jitters when the second wicket fell at 23. Australian Anthony Wilson took over and with an excellent 60 not out, achieved in 53 balls and with 14 fours for good measure, Whitley eased to victory after 14.4 overs and without further loss. The reversal of Elsecar’s fortunes over this past month has been remarkable and they completed their fourth win in succession against Conisbrough at St Peter’s Drive. Elsecar won the toss and decided to bat first. Ainsley Swallow led off with 32 and then an excellent third wicket partnership of 117 between Paul Cummings (63) and Scott Jones (66) laid the basis for a sizeable total of 274-7. Introduced late in the innings, Oliver Jackson snared four victims and claimed 4-62 from seven overs. Conisbrough tried in vain to maintain the required run rate and after skipper Nathan Smith left with 43 to his credit, a persistent rain shower saw the game heading towards an abandonment. However, the teams returned to the field at 8pm and Elsecar polished of the Conisbrough tailenders to see them all out for 155. Following their prowess with the bat Jones claimed 4-49 and Cummings 3-6. Darfield suffered a five wicket defeat at the hands of Wickersley Old Village. Darfield batted first and Peter Hadfield (60) and Adam Wiles (30) added 97 runs for the second wicket to take the score to 112-2 before the innings collapsed to 165 all out. Cal Jones (33), skipper Jordan Lowe (37) and Paul Lund (38no) led Wickersley home.